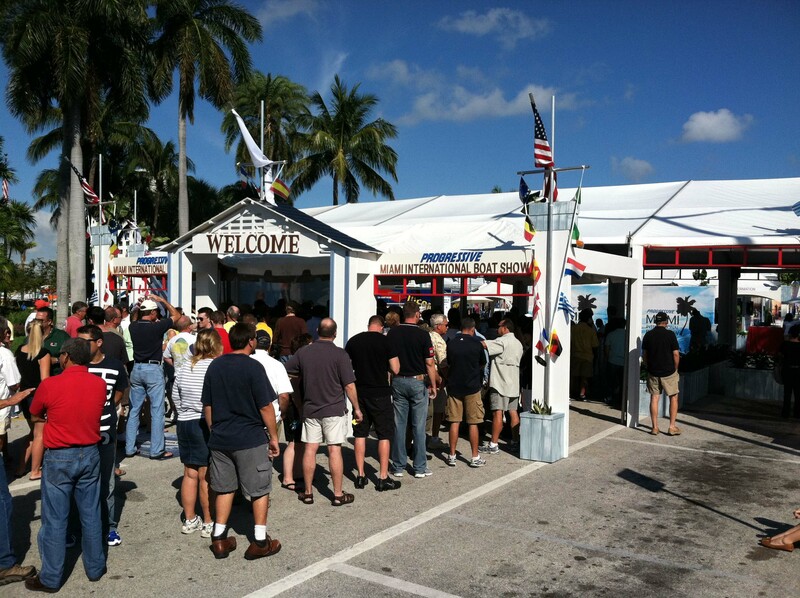 It was a beautiful, sunny Miami day on Thursday when I headed to the Miami International Boat Show. The Miami Boat Show is held at three separate locations: the Miami Beach Convention Center, the Sea Isle Marina (huge yachts on the water) and Strictly Sail which is held at Miamarina Bayside. 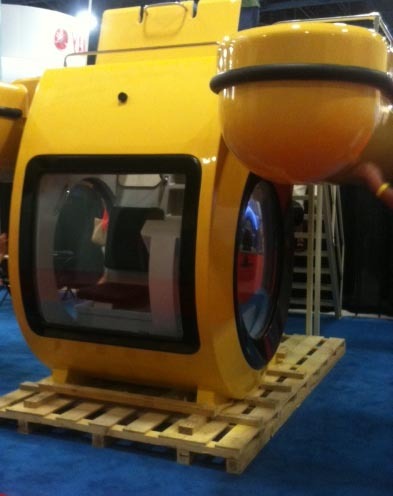 Yes, this is a personal submarine. As I was walking down aisle after aisle of the boat show I quickly realized that I am a true beginner when it comes to having a deep understanding of recreational boating or the pieces involved in choosing and buying a boat. There were many aisles of boats, watercraft, parts, outboards, propellers, life rafts, anchors, decking, navigational equipment, and even a personal submarine…it was truly overwhelming, but also exciting! 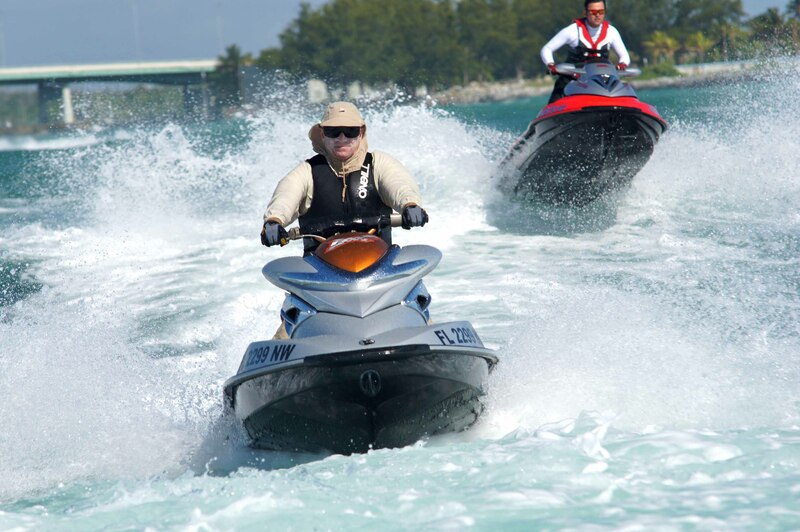 I have been researching purchasing a runabout style boat for my family of five and all the friends that go along with that, and wanted to ensure that I am making the right type of engine decision…the jet boats interest me for their ease of entry into the market, safety aspects, and the advanced technologies that make for a simple, fun day of the water. My first stop was to talk to popular boat companies representing outboard boats and stern drive boats. Each of the manufacturers that I visited extolled the virtues of their respective technology, but each also had some positive things to say about jet technology. In some areas, jet technology just couldn’t be beat: safety (no props—huge with kids jumping off of and getting in and out of the boat), space (the engine in the stern drives takes up a ton of useable open space) and performance. Other areas were about the same (gas usage) and towing features. After speaking with comparable manufacturers I was further convinced that a water jet propelled boat will fit my family’s needs and lifestyle the best. Next, I compared the two leading water jet propelled boat brands and inquired about the differences between their boats and Sea-Doo boats. The only real difference the sales person of the other brand could explain was that their boats were traditional and that they were happy to give up a good amount of cockpit space to offer a transom lounge area. . . 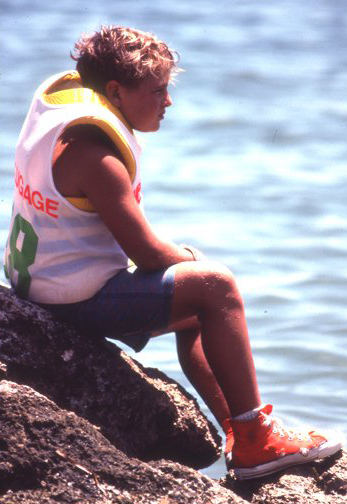 I thought to myself, I will probably spend more time in the boat than on the back, so this was a minor aspect to weigh. The also mentioned their strength in salt water usage. This was not a strong point of distinction to me. 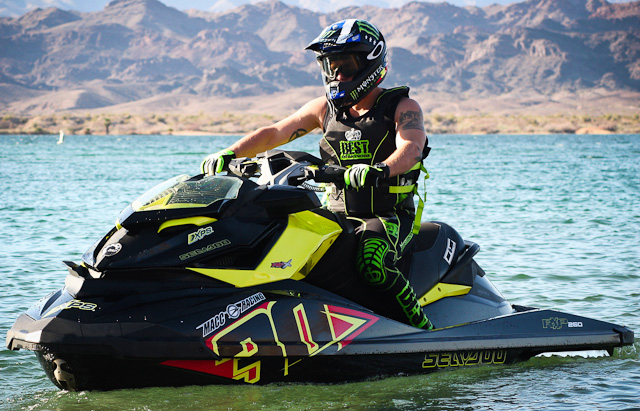 Sea-Doo has a closed loop cooling system that uses coolant, as opposed to salt or fresh water, to protect the engine from corrosion from salt water. The Sea-Doo sales person told it to me this way, “Would you put salt water into the radiator of you car? Why do it in a boat when you have the option of getting a boat with closed loop cooling with antifreeze running through its engine’s veins?” That made a lot of sense. After spending a few hours in competitive research mode, I decided to spend some time looking more closely at the Sea-Doo models. 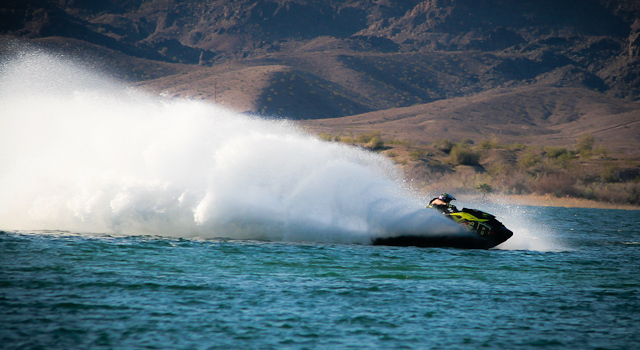 Sea-Doo had five boats at the show: a 150 Speedster, a 180 SP, a 210 Challenger S, a 230 Challenger and a 230 WAKE. I loved the color of the 150 Speedster, the Lucky Green popped! 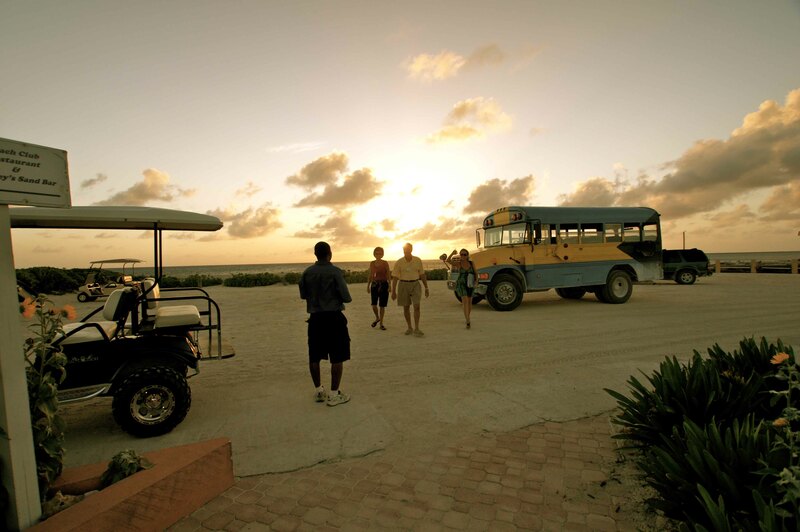 However, the speedster looks fun but with a family of five, one of us would be stuck on the beach. My teenage sons would love it for this reason — they would want to take it out without mom, dad and their little sister — but that is not why we want to purchase a family boat! 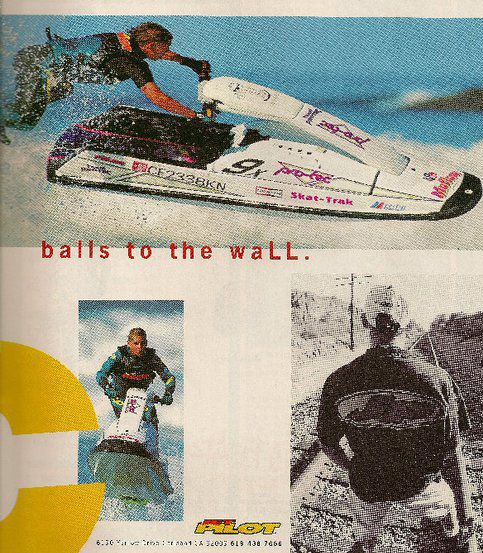 The colors, graphics and lines of the 230 WAKE are intriguing. I liked the features of the 230 WAKE: lights, additional speakers, arch tower, LCD touch screen, and I liked the overall size of the 230 WAKE. This one is still on my ‘potential’ list. 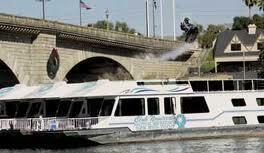 My kids love to be towed and would like the wake-specific features, so this one is ranked high on my list. The Challenger family is where my heart is and I am conflicted over the 210 Challenger SE and the 230 Challenger SE. 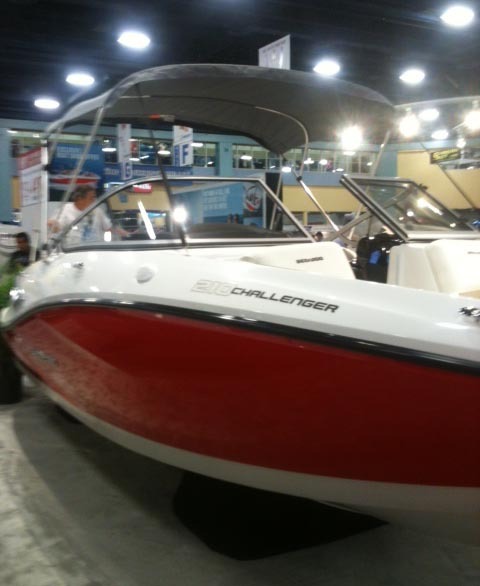 The 180 Challenger is a good family starter boat and would have been a good choice had we ventured into boating when the kids were younger. At this point my teenage sons are 6’ and 6’3” respectively, add a few friends and my daughter and her friends and you can easily see why a few more feet quickly becomes attractive! 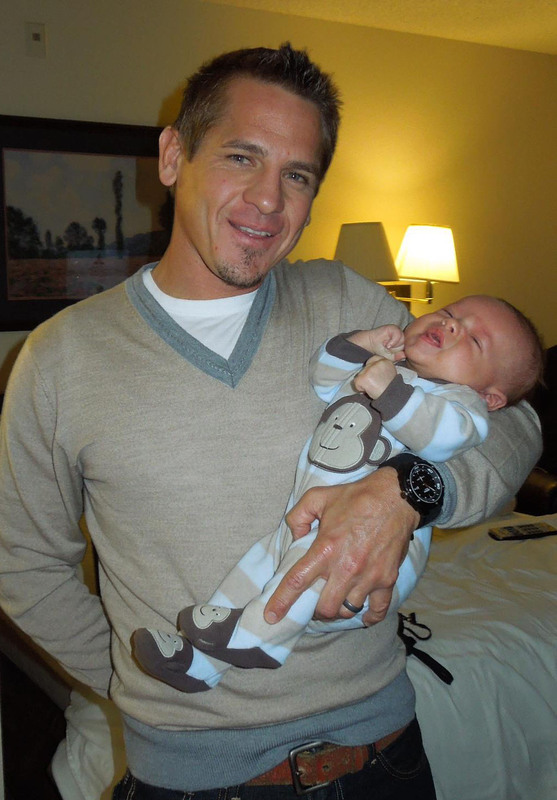 Each has similar features but also slight differences. 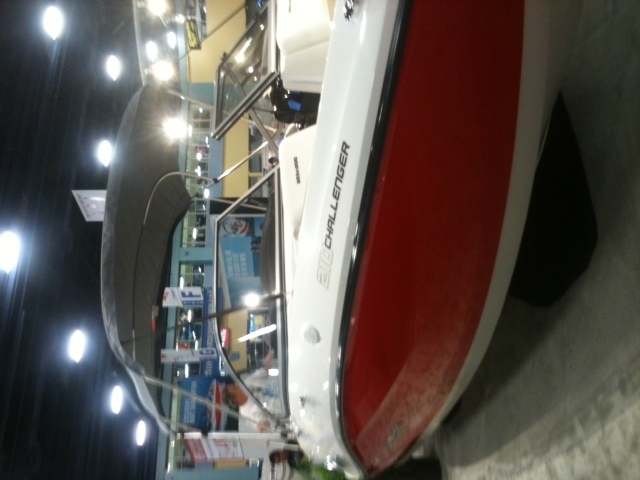 210 Challenger SE: This boat is very roomy inside for being 21-feet on the outside and has tons of storage. One of the highlight features is the Transat seats on the swim platform. We live in Florida and plan to spend a lot of time on lakes and the inter-coastal waterways. There are a lot of sandbars where everyone hangs out—on a busy weekend you will find 50 boats lined up on a sand bar with everyone enjoying the water. I plan to spend a lot of time lounging in these Transat seats at the sand bar and feel like this feature was made especially for me! I like the extra speakers and accessibility from the swim deck storage on the back of the boat as well. 230 Challenger SE: This one is probably number one on my list. I like the size of the boat. It’s listed as a 23-foot boat but closer to 24-feet; I like the roominess and the size of the open bow. The bow is one of the reasons that it is so high on my list….I envision arguments about who gets to sit in the bow as a regular occurrence. Just like they argue over the front seat of the car, the larger bow space on this model should help overcome these objections! I like the swim platform and the swim platform mat, which makes for safer and more comfortable entry and exit of the boat. I like the twin engines, removable cooler, storage…I just have to convince my family that this is the one. 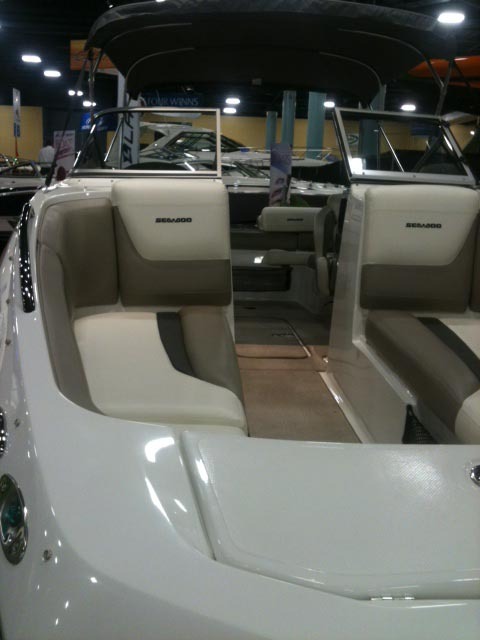 After spending time at the boat show, I am encouraged and have a clearer vision of the boats that we are interested in. Next step will be family discussions to determine which one is THE ONE. Wish me luck. SHE DOO is actually Mrs. Julie A and she is indeed a full-time, working mom of three and is quickly being immersed into the boating life. She will be taking an everyday consumer approach to the entire boat buying process. SHE DOO will be a ongoing segment at OnBoard taking you with her along the journey as she progresses through the process of looking for the right boat, purchasing the right boat, learning the proper boating procedures and operations, real life experiences on the water with her family and everything else there is to know about making the most out of the boating experience and the Sea-Doo LIFE. Her immediate thoughts are how to entertain her 16, 15 and 10 year olds and friends as she sees them being on the water as a much better alternative than them being on the streets.